Scots-Italians can trace their history back to the mass migrations of the late 1800s when they fled famine, corruption, a crippling economy and the disastrous agricultural condition of their homeland in order to find a better life in Scotland and generate income to support their families. Most of the immigration was from six key areas: Tuscany (mainly from he Province of Lucca - especially Barga and Garfagnana); Lazio (mainly from the Province of Frosinone - especially Picinisco); Molise (mainly from the Province of Isernia); Ligure (mainly from the Province of La Spezia); Campania (mainly post war period); Valdotaro and Borgotaro (mainly from the Province of Parma). The first settlers were mostly statue sellers who had come up from London. Fresh off the boat they would sell their wares in the ports (anything from humble statuettes to blocks of ice.) Many remained in the port cities of Glasgow, Greenock and Edinburgh, opening shops and serving dairy ice cream to the working classes of Garnethill, Paisley and the Grassmarket. In the beginning this was served direct from the barrows with shouts of "Gelati, ecco un poco". Consequently they became known as the 'Hokey Pokey' boys. The majority soon diversified. With dairy produce and seafood in abundance it wasn't long before ice cream-serving Fish 'n Chip shops began to sprout. These expanded into cafes, with full meals, confectionery and cigarettes added to the menu. 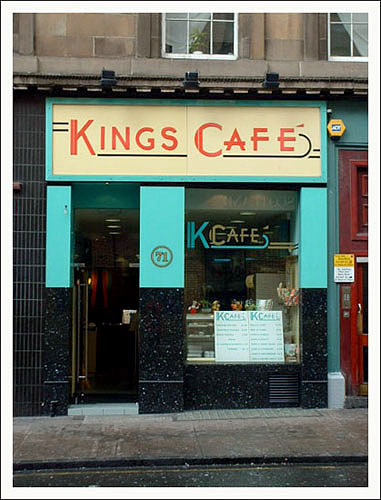 Italian cafes subsequently sprang up all over Scotland. Police records show the number of cafes in Glasgow alone had doubled by 1904 with 336 ice cream shops open by 1905. Once the cafe's were fully operational, it was expected that all family members chip in. The head of the business would commonly recruit young Italians, often from the home village. These Italians in turn would eventually start their own businesses in time. In the households Italian was spoken, Italian food was the staple diet with all the family dining together. Religious festivals were observed. Long anti-social hours meant little contact with people from outside the Italian community. It wasn't until the First World War that a sizeable Italian community - over 4,000 - began to emerge in Scotland with Glasgow housing the third largest community in Great Britain. Soon, the Italians diffused across the whole of Scotland rather than focus on any particular area. A large percentage of Italians in Scotland during the 30's had registered as Fascist Party members in response to calls from Mussolini. Italy's subsequent involvement in World War Two brought Italians many hardships: adult males were interned (some were held on the Isle of Man and Northern Ireland; some were even shipped to Australia and Canada.) Remaining family members were left to run dilapidated businesses and cope with mistrust and persecution. Many cafes were vandalised and it was not uncommon for businesses to have to be rebuilt from scratch following the end of the war. "Collar the lot! This was how Prime Minister Winston Churchill ordered the arrest of all Italian nationals within minutes of Italy declaring war on Britain on June 10, 1940 and thousands of Italian families throughout the country had the police knocking at their doors in the dead of night. Dad's business was given to a local businessman who paid the absurd rent of £2 a week. This was dad's only source of income so he was forced to become a garzone, an employee. To most of the older Italians of the time, used to being their own boss, this was humiliation and rather like being declared bankrupt. The contrast between the older generation who had retained their Italian citizenship and their offspring born in Britain was heavily tinged with bitter irony... The older generation, resident in Scotland for decades and known and well liked by the local population, were locked up as potential spies and many perished on the Arandora Star while their children were called up for military service... "